Some great partners just can't be kept apart. Chocolate and Peanut Butter, Mahoney and Hightower, space and monkeys...and now we can add Harry Potter and LEGO to the list. 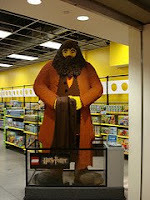 In the beginning of this decade, LEGO released a series of sets tied into the Harry Potter movies and locales. There was Hogwarts and quidditch and a series of ghoulish minifigs. Fast forward to today, and the news that LEGO and Harry Potter will again be paired in the video game, LEGO Harry Potter: Years 1-4. I'm glad that they found each other once more, maybe reuniting at a New Year's Eve Party or accidentally grabbing for a coffee at the same time and having their hands touch briefly. "Oh, hey LEGO...um...seems like you've been having a good year.."
"Sure, sure..but nothing like yours with the Half-Blood Prince set to come out..."
"No, come on, LEGO, you're really successful,"
Tickle fight ensues. That didn't get awkward.... After all, when has more Hagrid ever been a bad thing?